For other uses, see Tire (disambiguation). "Inner tube" redirects here. For the swimming device, see swim ring. "Rubber tires" redirects here. For the silent film, see Rubber Tires. A tire (American English) or tyre (British English; see spelling differences) is a ring-shaped component that surrounds a wheel's rim to transfer a vehicle's load from the axle through the wheel to the ground and to provide traction on the surface traveled over. Most tires, such as those for automobiles and bicycles, are pneumatically inflated structures, which also provide a flexible cushion that absorbs shock as the tire rolls over rough features on the surface. Tires provide a footprint that is designed to match the weight of the vehicle with the bearing strength of the surface that it rolls over by providing a bearing pressure that will not deform the surface excessively. The materials of modern pneumatic tires are synthetic rubber, natural rubber, fabric and wire, along with carbon black and other chemical compounds. They consist of a tread and a body. The tread provides traction while the body provides containment for a quantity of compressed air. Before rubber was developed, the first versions of tires were simply bands of metal fitted around wooden wheels to prevent wear and tear. Early rubber tires were solid (not pneumatic). Pneumatic tires are used on many types of vehicles, including cars, bicycles, motorcycles, buses, trucks, heavy equipment, and aircraft. Metal tires are still used on locomotives and railcars, and solid rubber (or other polymer) tires are still used in various non-automotive applications, such as some casters, carts, lawnmowers, and wheelbarrows. The word tire is a short form of attire, from the idea that a wheel with a tire is a dressed wheel. The spelling tyre does not appear until the 1840s when the English began shrink fitting railway car wheels with malleable iron. Nevertheless, traditional publishers continued using tire. The Times newspaper in Britain was still using tire as late as 1905. The spelling tyre began to be commonly used in the 19th century for pneumatic tires in the UK. The 1911 edition of the Encyclopædia Britannica states that "[t]he spelling 'tyre' is not now accepted by the best English authorities, and is unrecognized in the US", while Fowler's Modern English Usage of 1926 says that "there is nothing to be said for 'tyre', which is etymologically wrong, as well as needlessly divergent from our own [sc. British] older & the present American usage". However, over the course of the 20th century, tyre became established as the standard British spelling. The earliest tires were bands of leather, then iron (later steel) placed on wooden wheels used on carts and wagons. The tire would be heated in a forge fire, placed over the wheel and quenched, causing the metal to contract and fit tightly on the wheel. A skilled worker, known as a wheelwright, carried out this work. The first patent for what appears to be a standard pneumatic tire appeared in 1847 lodged by the Scottish inventor Robert William Thomson. However, this never went into production. The first practical pneumatic tire was made in 1888[note 1] on May Street, Belfast, by Scots-born John Boyd Dunlop, owner of one of Ireland's most prosperous veterinary practices. It was an effort to prevent the headaches of his 10-year-old son Johnnie, while riding his tricycle on rough pavements. 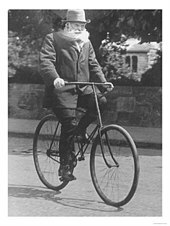 His doctor, John, later Sir John Fagan, had prescribed cycling as an exercise for the boy, and was a regular visitor. Fagan participated in designing the first pneumatic tires. Cyclist Willie Hume demonstrated the supremacy of Dunlop's tires in 1889, winning the tire's first-ever races in Ireland and then England. In Dunlop's tire patent specification dated 31 October 1888, his interest is only in its use in cycles and light vehicles. In September 1890, he was made aware of an earlier development but the company kept the information to itself. In 1892, Dunlop's patent was declared invalid because of prior art by forgotten fellow Scot Robert William Thomson of London (patents London 1845, France 1846, USA 1847), although Dunlop is credited with "realizing rubber could withstand the wear and tear of being a tire while retaining its resilience". John Boyd Dunlop and Harvey du Cros together worked through the ensuing considerable difficulties. They employed inventor Charles Kingston Welch and also acquired other rights and patents which allowed them some limited protection of their Pneumatic Tyre business's position. Pneumatic Tyre would become Dunlop Rubber and Dunlop Tyres. The development of this technology hinged on myriad engineering advances, including the vulcanization of natural rubber using sulfur, as well as by the development of the "clincher" rim for holding the tire in place laterally on the wheel rim. Synthetic rubbers were invented in the laboratories of Bayer in the 1920s. In 1946, Michelin developed the radial tire method of construction. Michelin had bought the bankrupt Citroën automobile company in 1934, so it was able to fit this new technology immediately. Because of its superiority in handling and fuel economy, use of this technology quickly spread throughout Europe and Asia. In the U.S., the outdated bias-ply tire construction persisted, with market share of 87% as late as 1967. Delay was caused by tire and automobile manufacturers in America "concerned about transition costs." In 1968, Consumer Reports, an influential American magazine, acknowledged the superiority of radial construction, setting off a rapid decline in Michelin's competitor technology. Even in the U.S., the radial tire now has a market share of 100% in automobiles. Today, over 1 billion tires are produced annually in over 400 tire factories (see List of tire companies). There are 2 aspects to how pneumatic tires support the rim of the wheel on which they are mounted. First, tension in the cords pull on the bead uniformly around the wheel, except where it is reduced above the contact patch. Second, the bead transfers that net force to the rim. Air pressure, via the ply cords, exerts tensile force on the entire bead surrounding the wheel rim on which the tire is mounted, pulling outward in a 360 degree pattern. Thus the bead must have high tensile strength. With no force applied to the outer tread, the bead is pulled equally in all directions, thus no additional net force is applied to the tire bead and wheel rim. However, when the tread is pushed inward on one side, this releases some tension in the corresponding sidewall ply pulling on the bead. Yet the sidewall ply on the other side continues to pull the bead in the opposite direction. Thus the still fully tensioned sidewall ply pulls the tire bead and wheel rim in the same direction as the tread displacement with equal force as that applied to push the tread inward. This sidewall ply to bead tension support was a big reason for older cross-ply cord tire construction using the materials available in the early 19th century. The cross-ply cord arrangement orients the cords to more directly support the bead & wheel rim (like a sling: bead to cord and around below the tread back to the opposite bead, both ways, thus crossing plies of cords). However, with improved combinations of cord, bead, rim materials, and manufacturing techniques, combined with ongoing focus and research on tire efficiency and durability, it became both feasible and desirable to manufacture radial-ply cord tires, which, for many applications (despite higher costs), outperform and more than outlast (reliable-usual-service-life/cost ratio) similar cross-ply cord tire designs by (a) facilitating a flatter contact pattern with more evenly distributed pressure on the momentarily stationary area of contact between tread & ground and (b) lower operating costs over time: due to reduced tire temperature, decreased rolling resistance, lower puncture rates, greater longevity, etc. Pneumatic tires are manufactured in about 450 tire factories around the world. Tire production starts with bulk raw materials such as rubber (60% -70% synthetic), carbon black, and chemicals and produces numerous specialized components that are assembled and cured. Many kinds of rubber are used, the most common being styrene-butadiene copolymer. The article Tire manufacturing describes the components assembled to make a tire, the various materials used, the manufacturing processes and machinery, and the overall business model. Styrene-butadiene copolymer (chemical structure pictured) is the most popular material used in the production of rubber tires. In 2004, $80 billion of tires were sold worldwide, in 2010 it was $140 billion (approximately 34% growth adjusting for inflation), and is expected to grow to $258 billion per year by 2019. In 2015, the US manufactured almost 170 million tires. Over 2.5 billion tires are manufactured annually, making the tire industry a major consumer of natural rubber. It is estimated that by 2019, 3 billion tires will be to be sold globally every year. As of 2011, the top three tire manufacturing companies by revenue were Bridgestone (manufacturing 190 million tires), Michelin (184 million), Goodyear (181 million); they were followed by Continental, and Pirelli. The Lego group produced over 318 million toy tires in 2011 and was recognized by Guinness World Records as having the highest annual production of tires by any manufacturer. The materials of modern pneumatic tires can be divided into two groups, the cords that make up the ply and the elastomer which encases them. The cords, which form the ply and bead and provide the tensile strength necessary to contain the inflation pressure, can be composed of steel, natural fibers such as cotton or silk, or synthetic fibers such as nylon or kevlar. The elastomer, which forms the tread and encases the cords to protect them from abrasion and hold them in place, is a key component of pneumatic tire design. It can be composed of various composites of rubber material – the most common being styrene-butadiene copolymer – with other chemical compound such as silica and carbon black. Optimizing rolling resistance in the elastomer material is a key challenge for reducing fuel consumption in the transportation sector. It is estimated that passenger vehicles consume approximately 5~15% of its fuel to overcome rolling resistance, while the estimate is understood to be higher for heavy trucks. However, there is a trade-off between rolling resistance and wet traction and grip: while low rolling resistance can be achieved by reducing the viscoelastic properties of the rubber compound (low tangent (δ)), it comes at the cost of wet traction and grip, which requires hysteresis and energy dissipation (high tangent (δ)). A low tangent (δ) value at 60 °C is used as an indicator of low rolling resistance, while a high tangent (δ) value at 0 °C is used as an indicator of high wet traction. Designing an elastomer material that can achieve both high wet traction and low rolling resistance is key in achieving safety and fuel efficiency in the transportation sector. The most common elastomer material used today is a styrene-butadiene copolymer. It combines the properties of polybutadiene, which is a highly rubbery polymer (Tg = -100 °C) having high hysteresis and thus offering good wet grip properties, with the properties of polystyrene, which is a glassy polymer (Tg = 100 °C) having low hysteresis and thus offering low rolling resistance in addition to wear resistance. Therefore, the ratio the two monomers in the styrene-butadiene copolymer is considered key in determining the glass transition temperature of the material, which is correlated to its grip and resistance properties. Materials science research efforts are underway to improve such properties of elastomers. For instance, this involves modifying the microstructure of the copolymer (for instance, using solution styrene butadiene rubber (S-SBR) to control the addition of vinyl butadiene units) as well as the macrostructure of the polymer (such as the width of molecular weight distribution (MWD)). Current investigation also involves looking at the functionalization of the elastomer through the addition of filler materials such as silica and carbon black, as well as testing other nano-fillers such as nanocellulose crystals, carbon nanotubes, and graphene. Trialkoxymercaptoalkyl-silanes are a class of silane bonding agents that offer advantages in reduced rolling resistance and emission of volatile substances. The tread is the part of the tire that comes in contact with the road surface. The portion that is in contact with the road at a given instant in time is the contact patch. The tread is a thick rubber, or rubber/composite compound formulated to provide an appropriate level of traction that does not wear away too quickly. The tread pattern is characterized by the geometrical shape of the grooves, lugs, voids and sipes. Grooves run circumferentially around the tire, and are needed to channel away water. Lugs are that portion of the tread design that contacts the road surface. Voids are spaces between lugs that allow the lugs to flex and evacuate water. Tread patterns feature non-symmetrical (or non-uniform) lug sizes circumferentially to minimize noise levels at discrete frequencies. Sipes are slits cut across the tire, usually perpendicular to the grooves, which allow the water from the grooves to escape to the sides in an effort to prevent hydroplaning. Treads are often designed to meet specific product marketing positions. High-performance tires have small void ratios to provide more rubber in contact with the road for higher traction, but may be compounded with softer rubber that provides better traction, but wears quickly. Mud and snow (M&S) tires are designed with higher void ratios to channel away rain and mud, while providing better gripping performance. The rain groove is a design element of the tread pattern specifically arranged to channel water away from the footprint. Rain grooves are circumferential in most truck tires. Many high-performance passenger tires feature rain grooves that are angled from the center toward the sides of the tire. Some tire manufacturers claim that their tread pattern is designed to actively pump water out from under the tire by the action of the tread flexing. This results in a smoother ride in different types of weather. Tread lugs often feature slits—sipes—that improve the flexibility of the lug to deform as it traverses the footprint area. This reduces shear stress in the lug and reduces heat build up. Testing of identical siped and unsiped tires showed measurable improvements in snow traction and ice braking performance, however diminishing and extending braking distances on wet and dry pavement by a few feet on siped tires. Off-road tire enthusiasts have been siping tires for years for greater traction, as many manufacturers now offer already siped off-road-tires. Wear bars (or wear indicators) are raised features located at the bottom of the tread grooves that indicate the tire has reached its wear limit. When the tread lugs are worn to the point that the wear bars connect across the lugs, the tires are fully worn and should be taken out of service. Most wear bars indicate a remaining tread depth of 1.6 millimetres (0.063 in) and are tires are deemed "worn out" when the tread is worn down to that point. The tire bead is the part of the tire that contacts the rim on the wheel. The bead is typically reinforced with steel wire and compounded of high strength, low flexibility rubber. The bead seats tightly against the two rims on the wheel to ensure that a tubeless tire holds air without leakage. The bead fit is tight to ensure the tire does not shift circumferentially as the wheel rotates. The width of the rim in relationship to the tire is a factor in the handling characteristics of an automobile, because the rim supports the tire's profile. 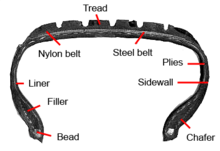 The sidewall is that part of the tire, or bicycle tire, that bridges between the tread and bead. The sidewall is largely rubber but reinforced with fabric or steel cords that provide for tensile strength and flexibility. The sidewall contains air pressure and transmits the torque applied by the drive axle to the tread to create traction but supports little of the weight of the vehicle, as is clear from the total collapse of the tire when punctured. Sidewalls are molded with manufacturer-specific detail, government mandated warning labels, and other consumer information, and sometimes decorative ornamentation, like whitewalls or tire lettering. Plies are layers of relatively inextensible cords embedded in the rubber to hold its shape by preventing the rubber from stretching in response to the internal pressure. The orientations of the plies play a large role in the performance of the tire and is one of the main ways that tires are categorized. Several additional components may be required in addition to just the tire to form a functional wheel. Tires are mounted onto wheels that most often have integral rims on their outer edges to hold the tire. Automotive wheels are typically made from pressed and welded steel, or a composite of lightweight metal alloys, such as aluminum or magnesium. These alloy wheels may be either cast or forged. The mounted tire and wheel assembly is then bolted to the vehicle's hub. A decorative hubcap and trim ring may be placed over the wheel. Most bicycle tires, many motorcycle tires, and many tires for large vehicles such as buses, heavy trucks, and tractors are designed for use with inner tubes. Inner tubes are torus-shaped balloons made from an impermeable material, such as soft, elastic synthetic rubber, to prevent air leakage. The inner tubes are inserted into the tire and inflated to retain air pressure. Large inner tubes can be re-used for other purposes, such as swimming and rafting (see swim ring), tubing (recreation), sledding, and skitching. Purpose-built inflatable tori are also manufactured for these uses, offering choice of colors, fabric covering, handles, decks, and other accessories, and eliminating the protruding valve stem. The valve stem is a tube made of metal or rubber, through which the tire is inflated, with a check valve, typically a Schrader valve on automobiles and most bicycle tires, or a Presta valve on high-performance bicycles. Valve stems usually protrude through the wheel for easy access. They mount directly to the rim, in the case of tubeless tires, or are an integral part of the inner tube. The rubber in valve stems eventually degrades, and, in the case of tubeless tires, replacement of the valve stem at regular intervals or with tire replacement reduces the chance of failure. Some may notice that their valve stem is all metal with a nut retaining it (as opposed to the typical rubber stem with brass threads). Most modern passenger vehicles are now required to have a tire pressure monitoring system which usually consists of a valve stem attached to an electronic module. The module is hidden inside and is only visible when the tire has been removed from the wheel. Radial tire technology is now the standard design for essentially all automotive tires, but other methods have been used. Bias tire (or cross ply) construction utilizes body ply cords that extend diagonally from bead to bead, usually at angles in the range of 30 to 40 degrees, with successive plies laid at opposing angles forming a crisscross pattern to which the tread is applied. The design allows the entire tire body to flex easily, providing the main advantage of this construction, a smooth ride on rough surfaces. This cushioning characteristic also causes the major disadvantages of a bias tire: increased rolling resistance and less control and traction at higher speeds. This outdated technology is still made in limited quantities to supply collector vehicles. It is possible to fit older cars with modern tires if historical authenticity is not paramount. A belted bias tire starts with two or more bias-plies to which stabilizer belts are bonded directly beneath the tread. This construction provides smoother ride that is similar to the bias tire, while lessening rolling resistance because the belts increase tread stiffness. The design was introduced by Armstrong, while Goodyear made it popular with the "Polyglas" trademark tire featuring a polyester carcass with belts of fiberglass. The "belted" tire starts two main plies of polyester, rayon, or nylon annealed as in conventional tires, and then placed on top are circumferential belts at different angles that improve performance compared to non-belted bias tires. The belts may be fiberglass or steel. This technology was a temporary, not invented here stop-gap, introduced by U.S. manufacturers to forestall the radial tire. Radial tire construction utilizes body ply cords extending from the beads and across the tread so that the cords are laid at approximately right angles to the centerline of the tread, and parallel to each other, as well as stabilizer belts directly beneath the tread. The belts may be cord or steel. The advantages of this construction include longer tread life, better steering control, fewer blowouts, improved fuel economy, and lower rolling resistance. Disadvantages of the radial tire are a harder ride at low speeds on rough roads and in the context of off-roading, decreased "self-cleaning" ability and lower grip ability at low speeds. Following the 1968 Consumer Reports announcement of the superiority of the radial design, radials began an inexorable climb in market share, reaching 100% of the North America market in the 1980s. Tubeless tires are pneumatic tires that do not require a separate inner tube. An airless tire is a non-pneumatic tire that is not supported by air pressure. They are most commonly used on small vehicles, such as golf carts, and on utility vehicles in situations where the risk of puncture is high, such as on construction equipment. Some railway wheels and other older types of rolling stock are fitted with railway tires in order to prevent the need to replace the entirety of a wheel. The tire, usually made of steel, surrounds the wheel and is primarily held in place by interference fit. Tires are specified by the vehicle manufacturer with a recommended inflation pressure, which permits safe operation within the specified load rating and vehicle loading. Most tires are stamped with a maximum pressure rating. For passenger vehicles and light trucks, the tires should be inflated to what the vehicle manufacturer recommends, which is usually located on a decal just inside the driver's door or in the vehicle owners handbook. Tires should not generally be inflated to the pressure on the sidewall; this is the maximum pressure, rather than the recommended pressure. Inflated tires naturally lose pressure over time. Not all tire-to-rim seals, valve-stem-to-rim seals, and valve seals themselves are perfect. Furthermore, tires are not completely impermeable to air, and so lose pressure over time naturally due to diffusion of molecules through the rubber. Some drivers and stores inflate tires with nitrogen (typically at 95% purity), instead of atmospheric air, which is already 78% nitrogen, in an attempt to keep the tires at the proper inflation pressure longer. The effectiveness of the use of nitrogen vs. air as a means to reduce the rate of pressure loss is baseless, and has been shown to be a bogus marketing gimmick. One study noted a 1.3 psi (9.0 kPa; 0.090 bar) difference (from an initial pressure of 30 psi (210 kPa; 2.1 bar)) for air-filled vs. nitrogen-filled tires. The test showed an average loss of 2.2 psi (15 kPa) for the nitrogen filled tires compared to 3.5 psi (24 kPa) for the air filled tires. However, the statistical significance of the test was not given as no t-test nor p values were reported. And they do note that the loss in both the nitrogen filled tires and the air filled tires mean that tire pressures should be checked regularly. The tire contact patch is readily changed by both over- and underinflation. Overinflation may increase the wear on the center contact patch, and underinflation will cause a concave tread, resulting in less center contact, though the overall contact patch will still be larger. Most modern tires will wear evenly at high tire pressures, but will degrade prematurely if underinflated. An increased tire pressure may decrease rolling resistance, and may also result in shorter stopping distances If tire pressure is too low, the tire contact patch is greatly increased. This increases rolling resistance, tire flexing, and friction between the road and tire. Under-inflation can lead to tire overheating, premature tread wear, and tread separation in severe cases. The speed rating denotes the maximum speed at which a tire is designed to be operated. For passenger vehicles these ratings range from 160 to 300 km/h (99.4 to 186 mph). For a table of speed ratings, see tire code. The treadwear rating or treadwear grade is how long the tire manufacturers expect the tire to last. A Course Monitoring Tire (the standard tire that a test tire will be compared to) has a rating of "100". If a manufacturer assigns a treadwear rating of 200 to a new tire, they are indicating that they expect the new tire to have a useful lifespan that is 200% of the life of a Course Monitoring Tire. The "test tires" are all manufacturer-dependent. Brand A's rating of 500 is not necessarily going to offer drivers the same mileage rating as Brand B's tire of the same rating. The testing is non-regulated and can vary greatly. Treadwear ratings are only useful for comparing Brand A's entire lineup against itself. Tread wear, also known as tire wear, is caused by friction between the tire and the road surface. Government legal standards prescribe the minimum allowable tread depth for safe operation. Tires may exhibit irregular wear patterns once installed on a vehicle and partially worn. Front-wheel drive vehicles tend to wear the front tires at a greater rate compared to the rear tires. Tire rotation is moving the tires to different car positions, such as front-to-rear, in order to even out the wear, with the objective of extending the life of the tire. When mounted on the vehicle, the wheel and tire may not be perfectly aligned to the direction of travel, and therefore may exhibit irregular wear. If the discrepancy in alignment is large, then the irregular wear will become substantial if left uncorrected. Wheel alignment is the procedure for checking and correcting this condition through adjustment of camber, caster and toe angles. The adjustment of the angles should be done as per the OEM specifications. Tires that are fully worn can be re-manufactured to replace the worn tread. This is known as retreading or recapping, a process of buffing away the worn tread and applying a new tread. Retreading is economical for truck tires because the cost of replacing the tread is less than the price of a new tire. Retreading passenger tires is less economical because the cost of retreading is high compared to the price of new cheap tires, but favorable compared to high-end brands. Worn tires can be retreaded by two methods, the mold or hot cure method and the pre-cure or cold one. The mold cure method involves the application of raw rubber on the previously buffed and prepared casing, which is later cured in matrices. During the curing period, vulcanization takes place and the raw rubber bonds to the casing, taking the tread shape of the matrix. On the other hand, the pre-cure method involves the application of a ready-made tread band on the buffed and prepared casing, which later is cured in an autoclave so that vulcanization can occur. During the retreading process, retread technicians must ensure the casing is in the best condition possible to minimize the possibility of a casing failure. Casings with problems such as capped tread, tread separation, irreparable cuts, corroded belts or sidewall damage, or any run-flat or skidded tires, will be rejected. In most situations, retread tires can be driven under the same conditions and at the same speeds as new tires with no loss in safety or comfort. The percentage of retread failures should be about the same as for new tire failures, but many drivers, including truckers, are guilty of not maintaining proper air pressure on a regular basis, and, if a tire is abused (overloaded, underinflated, or mismatched to the other tire on a set of duals), then that tire (new or recapped) will fail. Many commercial trucking companies put retreads only on trailers, using only new tires on their steering and drive wheels. This procedure increases the driver's chance of maintaining control in case of problems with a retreaded tire. The interaction of a tire with the pavement is a very complex phenomenon. Many of the details are modeled in Pacejka's Magic Formula. Some are explained below. When a wheel and tire rotate, they exert a centrifugal force on the axle that depends on the location of their center of mass and the orientation of their moment of inertia. This is referred to as balance, imbalance, or unbalance. Tires are checked at the point of manufacture for excessive static imbalance and dynamic imbalance using automatic tire balance machines. Tires are checked again in the auto assembly plant or tire retail shop after mounting the tire to the wheel. Assemblies that exhibit excessive imbalance are corrected by applying balance weights to the wheels to counteract the tire/wheel imbalance. An alternative method to tire balancing is the use of internal tire balancing agents. These agents take advantage of centrifugal force and inertia to counteract the tire imbalance. To facilitate proper balancing, most high-performance tire manufacturers place red and yellow marks on the sidewalls to enable the best possible match-mounting of the tire/wheel assembly. There are two methods of match-mounting high-performance tire to wheel assemblies using these red (uniformity) or yellow (weight) marks. Camber thrust and camber force are the force generated perpendicular to the direction of travel of a rolling tire due to its camber angle and finite contact patch. A tire rotating at higher speeds tends to develop a larger diameter, due to centrifugal forces that force the tread rubber away from the axis of rotation. This may cause speedometer error. As the tire diameter grows, the tire width decreases. This centrifugal growth can cause rubbing of the tire against the vehicle at high speeds. Motorcycle tires are often designed with reinforcements aimed at minimizing centrifugal growth. The circle of forces, traction circle, friction circle, or friction ellipse is a useful way to think about the dynamic interaction between a vehicle's tire and the road surface. The contact patch, or footprint, of the tire, is the area of the tread that is in contact with the road surface. This area transmits forces between the tire and the road via friction. The length-to-width ratio of the contact patch affects steering and cornering behavior. Cornering force or side force is the lateral (i.e. parallel to the road surface) force produced by a vehicle tire during cornering. Dry traction is measure of the tire's ability to deliver traction, or grip, under dry conditions. Dry traction is a function of the tackiness of the rubber compound. The tire tread and sidewall elements undergo deformation and recovery as they enter and exit the footprint. Since the rubber is elastomeric, it is deformed during this cycle. As the rubber deforms and recovers, it imparts cyclical forces into the vehicle. These variations are collectively referred to as tire uniformity. Tire uniformity is characterized by radial force variation (RFV), lateral force variation (LFV) and tangential force variation. Radial and lateral force variation is measured on a force variation machine at the end of the manufacturing process. Tires outside the specified limits for RFV and LFV are rejected. Geometric parameters, including radial runout, lateral runout, and sidewall bulge, are measured using a tire uniformity machine at the tire factory at the end of the manufacturing process as a quality check. In the late 1990s, Hunter Engineering introduced the GSP9700 Road Force balancer, which is equipped with a load roller similar to the force variation machine used at the factory to grade tire uniformity. This machine can find the best position for the tire on a given wheel so that the over-all assembly is as round as possible. Load sensitivity is the behaviour of tires under load. Conventional pneumatic tires do not behave as classical friction theory would suggest. Namely, the load sensitivity of most real tires in their typical operating range is such that the coefficient of friction decreases as the vertical load, Fz, increases. Pneumatic trail of a tire is the trail-like effect generated by compliant tires rolling on a hard surface and subject to side loads, as in a turn. More technically, it is the distance that the resultant force of side-slip occurs behind the geometric center of the contact patch. Relaxation length is the delay between when a slip angle is introduced and when the cornering force reaches its steady-state value. Pneumatic tires also have a much lower rolling resistance than solid tires. Because the internal air pressure acts in all directions, a pneumatic tire is able to "absorb" bumps in the road as it rolls over them without experiencing a reaction force opposite to the direction of travel, as is the case with a solid (or foam-filled) tire. The difference between the rolling resistance of a pneumatic and solid tire is easily felt when propelling wheelchairs or baby buggies fitted with either type so long as the terrain has a significant roughness in relation to the wheel diameter. Self-aligning torque, also known as the aligning torque, SAT or Mz, is the torque that a tire creates as it rolls along that tends to steer it, i.e. rotate it around its vertical axis. Vertical stiffness, or spring rate, is the ratio of vertical force to vertical deflection of the tire, and it contributes to the overall suspension performance of the vehicle. In general, spring rate increases with inflation pressure. Performance-oriented tires have a tread pattern and rubber compounds designed to grip the road surface, and so usually have a slightly shorter stopping distance. However, specific braking tests are necessary for data beyond generalizations. The work load of a tire is monitored so that it is not put under undue stress, which may lead to its premature failure. Work load is measured in Ton Kilometer Per Hour (TKPH). The measurement's appellation and units are the same. The recent shortage and increasing cost of tires for heavy equipment has made TKPH an important parameter in tire selection and equipment maintenance for the mining industry. For this reason, manufacturers of tires for large earth-moving and mining vehicles assign TKPH ratings to their tires based on their size, construction, tread type, and rubber compound. The rating is based on the weight and speed that the tire can handle without overheating and causing it to deteriorate prematurely. The equivalent measure used in the United States is Ton Mile Per Hour (TMPH). There are several types of abnormal tread wear. Poor wheel alignment can cause excessive wear of the innermost or outermost ribs. Gravel roads, rocky terrain, and other rough terrain causes accelerated wear. Over-inflation above the sidewall maximum can cause excessive wear to the center of the tread. Modern tires have steel belts built in to prevent this. Under-inflation causes excessive wear to the outer ribs. Unbalanced wheels can cause uneven tire wear, as the rotation may not be perfectly circular. Tire manufacturers and car companies have mutually established standards for tread wear testing that include measurement parameters for tread loss profile, lug count, and heel-toe wear. See also Work load above. Wet traction is the tire's traction, or grip, under wet conditions. Wet traction is improved by the tread design's ability to channel water out of the tire footprint and reduce hydroplaning. However, tires with a circular cross-section, such as those found on racing bicycles, when properly inflated have a sufficiently small footprint to not be susceptible to hydroplaning. For such tires, it is observed that fully slick tires will give superior traction on both wet and dry pavement. The DOT Code is an alphanumeric character sequence molded into the sidewall of the tire and allows the identification of the tire and its age. The code is mandated by the U.S. Department of Transportation but is used worldwide. The DOT Code begins with the letters "DOT" followed by a plant code (two numbers or letters) that represents the manufacturing plant. The last four numbers represent the week and year the tire was built. A three-digit code was used for tires manufactured before 2000. For example, 178 means it was manufactured in the 17th week of 8th year of the decade. In this case it means 1988. For tires manufactured in the 1990s, the same code holds true, but there is a little triangle (Δ) after the DOT code. Thus, a tire manufactured in the 17th week of 1998 would have the code 178Δ. In 2000, the code was switched to a 4-digit code. Same rules apply, so for example, 3003 means the tire was manufactured in the 30th week of 2003. Other numbers are marketing codes used at the manufacturer's discretion. The DOT Code is also useful in identifying tires subject to product recall or at end of life due to age. The British Rubber Manufacturers Association (BRMA) recommended practice, issued June 2001, states, "BRMA members strongly recommend that unused tyres should not be put into service if they are over six years old and that all tyres should be replaced ten years from the date of their manufacture." All tires sold for road use in Europe after July 1997 must carry an E-mark. The mark itself is either an upper case "E" or lower case "e" – followed by a number in a circle or rectangle, followed by a further number. An (upper case) "E" indicates that the tire is certified to comply with the dimensional, performance and marking requirements of ECE regulation 30. A (lower case) "e" indicates that the tire is certified to comply with the dimensional, performance and marking requirements of Directive 92/23/EEC. The number in the circle or rectangle denotes the country code of the government that granted the type approval. The last number outside the circle or rectangle is the number of the type approval certificate issued for that particular tire size and type. Tire manufacturers usually embed a mold serial number into the sidewall area of the mold, so that the tire, once molded, can be traced back to the mold of original manufacturer. Automobile tires are described by an alphanumeric code, which is generally molded into the sidewall of the tire. This code specifies the dimensions of the tire, and some of its key limitations, such as load-bearing ability, and maximum speed. Sometimes the inner sidewall contains information not included on the outer sidewall, and vice versa. The code has grown in complexity over the years, as is evident from the mix of metric and English units, and ad-hoc extensions to lettering and numbering schemes. New automotive tires frequently have ratings for traction, treadwear, and temperature resistance (collectively known as The Uniform Tire Quality Grade (UTQG) ratings). Most tires sizes are given using the ISO Metric sizing system. However, some pickup trucks and SUVs use the Light Truck Numeric or Light Truck High Flotation system. Tires are classified into several standard types, based on the type of vehicle they serve. Since the manufacturing process, raw materials, and equipment vary according to the tire type, it is common for tire factories to specialize in one or more tire types. In most markets, factories that manufacture passenger and light truck radial tires are separate and distinct from those that make aircraft or off-the-road (OTR) tires. High-performance tires are designed for use at higher speeds, and more often, a more "sporty" driving style. They feature a softer rubber compound for improved traction, especially on high speed cornering. The trade off of this softer rubber is shorter tread life. High-performance street tires sometimes sacrifice wet weather handling by having shallower water channels to provide more actual rubber tread surface area for dry weather performance. The ability to provide a high level of performance on both wet and dry pavement varies widely among manufacturers, and even among tire models of the same manufacturer. This is an area of active research and development, as well as marketing. A winter tire without studs, showing tread pattern designed to compact snow in the gaps. Mud and Snow, (or M+S, or M&S), is a for all-season and winter tires designed to provide improved traction on snow and ice, compared to summer tires. These tires have a more aggressive tread along at least one edge of the tire, designed to engage a snowy surface. Some winter tires are fabricated to allow the optional insertion of metal studs (consisting of a tungsten carbide or other hard material pin embedded in a base of a softer metal) for additional traction on icy roads. The use of studs is restricted in some countries due to the increased road wear that they cause, with the notable exception of most Nordic and North American jurisdictions, where they are commonly used in colder areas during the winter season. Norway has implemented fees for using studded tires in some urban areas, and there are a few streets in some of the major cities in Sweden where studs are not allowed. In America, studs are typically never used on heavier vehicles (except for some emergency vehicles like ambulances and fire trucks. ), but stud tires for heavy vehicles are commonplace in Scandinavia. Ice resurfacers also use studded tires. The upper tier classes of ice racing and rallying mandates the vehicles be equipped with studded tires. Other winter tires rely on factors other than studding for traction on ice, e.g. highly porous or hydrophilic rubber that adheres to the wet film on the ice surface. The best stud-less winter tires offer grip close to that of studded tires during most winter conditions, with the notable exception of blank or polished ice, where they cannot match the performance of studded tires. The reason for this is that stud-less winter tires rely on unevenness in the ice surface for their sipes to grab, while studs cut into even the most polished ice surface (and in the process also make it uneven). Studded tires are also used on bicycles, and the grip advantage on ice is similar to that from using traction sand, with the difference that there is no risk of blank spots when using studded tires. Quality tire manufacturers use studs with hard center pins also for bicycle tires, and just like their automobile counterparts, those studs will continue to protrude from the tire even after many years of usage on bare pavement. There are also low-quality studded bicycle tires being sold that have studs that lack the hard-metal center pin (there is still a center pin, but it is not made of hard metal). Such studs can wear out within a few weeks of cycling on dry pavement. Mud tires are specialty tires with large, chunky tread patterns designed to penetrate soft material, such as mud, snow, or sand. The large, open design also allows mud to clear from between the lugs more easily then from traditional designs. Mud tires tend to be wider than other tires, to spread the weight of the vehicle over a greater area to prevent the vehicle from sinking too deeply into the soft material. On sufficiently thin layers of soft material, however, narrow tires can be helpful because the tires will have more pressure in the contact patch, which enables the tires to penetrate a loose top layer and grip firmer material or pavement below. This does not work when the soft material is too deep, in which case the vehicle will sink into the into it and may become unable to compact or push it out of the way. In this case, wider tires may work better, as they can have a larger contact patch and are better able to 'float' on top of the soft material. Some mud tires also feature self-cleaning design, which is helpful in off-road situations and helps prevent sticky material, such as mud or snow, from accumulating in the gaps between lugs. Mud tires can also perform well on rocky terrain and provide good grip and traction. The All Season tire classification is a compromise between one developed for use on dry and wet roads during summer and one developed for use under winter conditions. The type of rubber and the tread pattern best suited for use under summer conditions cannot, for technical reasons, give good performance on snow and ice. The all-season tire is a compromise, and is neither an excellent summer tire nor an excellent winter tire. They have, however, become ubiquitous as original and replacement equipment on automobiles marketed in the United States, due to their convenience and their adequate performance in most situations. Even so, in other parts of the world, like Germany, it is common to have a designated tire set for winter and summer. All-Season tires are also marked for mud and snow the same as winter tires but rarely with a snowflake. Owing to the compromise with performance during summer, winter performance is usually poorer than a winter tire. Some vehicles carry a spare tire, already mounted on a wheel, to be used in the event of flat tire or blowout. Minispare, or "space-saver spare" tires are smaller than normal tires to save on trunk/boot space, gas mileage, weight, and cost. Minispares have a short life expectancy and a low speed rating, often below 60 miles per hour (97 km/h). Domestic Trailers (including camping trailers) for use on public highways often have different tires than those seen on cars. Often they are bias ply rather than radial tires, and they often don't have as aggressive a tread pattern as standard road tires. They are not built for high traction in most cases, because in most cases it is not vital that trailer tires have as good a traction as that of the vehicle towing the trailer. Several innovative designs have been introduced that permit tires to run safely with no air for a limited range at a limited speed. These tires typically feature strong, load-supporting sidewalls. Another approach is an auxiliary support structure fixed to the rim inside the pneumatic tyre that will bear the load in the event of a deflation. A disadvantage is that many run-flat tires cannot be repaired if a puncture occurs. This is due to manufacturer's informing the automotive industry that the state in which the sidewall is in cannot be determined due to the compacted sidewall of rubber. Some brands may permit one repair to a run flat tire, while others do not allow any. Heavy duty tires are also referred to as Truck/Bus tires. These are the tire sizes used on vehicles such as commercial freight trucks, dump trucks, and passenger buses. Truck tires are sub-categorized into specialties according to vehicle position such as steering, drive axle, and trailer. Each type is designed with the reinforcements, material compounds, and tread patterns that best optimize the tire performance. A relatively new concept is the use of "Super Singles" or Wide Singles. Generally in a dual configuration, there are 2 tires per position, each between 275 mm-295 mm wide. The Super Single replaces these with a single tire, usually 455 mm wide. This allows for less tread to be contacting the ground and also eliminates 2 sidewalls per position. Along with the weight savings of about 91 kilograms (200 lb) per axle, this enables vehicles using these to improve fuel economy. Off-the-road (OTR) tires include all tires not running on the common roads, such as fitted on construction vehicles (wheel loaders, backhoes, graders, trenchers), on airplanes, on mining vehicles, on forestry machinery. OTR tires can be of either bias or radial construction although the industry is trending toward increasing use of radial. Bias OTR tires are built with a large number of reinforcing plies to withstand severe service conditions and high loads. Dramatically increasing commodity prices has led to shortages of new tires. As a consequence, multimillion-dollar trucks can be idled for lack of tires, costing mines millions of dollars in lost productivity. This has led to a stronger effort to recycle old OTR tires. As of 2008, a new OTR tire can cost up to $50,000; retread tires are sold at half the price of new tires, and last 80% as long. Retreading an OTR tire is labor-intensive. First, the retreading technician must place the old tire in a buffing machine to remove what remains of the old tread; "skiving" follows this, which is the removal, by hand, of material the buffing misses. Next, the technician must inspect the tire, repairing defects. Lastly, the technician fills holes in the tire with rubber, applies a cement gum adhesive, and places the tire on a machine that will apply a new tread. The agricultural tire classification includes tires used on farm vehicles, typically tractors and specialty vehicles like harvesters. Driven wheels have very deep, widely spaced lugs to allow the tire to grip soil easily. For off-road driving in a passenger vehicle, such as in mud, sand, or deep snow, high flotation tires are typically used. Flotation tires are not the same as M+S tires, as they are designed for low speeds and full-time off-road use rather than muddy and snow-covered roads. Flotation tires also help traction in swampy environments and where soil compaction is a concern, featuring large footprints at low inflation pressures to spread out the area where the rubber meets the ground. Knobby tires are particularly useful where the ground consists of loose particles that can be displaced by the knobs. Although the low pressure improves traction in many types of terrain, adjustments may need to be made for hard surfaces like paved and unpaved roads. Vehicles that use flotation tires for rock climbing are susceptible to flat tires in which the tire pops off the rim, breaking the "bead." Racing tires are highly specialized according to vehicle and race track conditions. This classification includes tires for drag racing, Auto-x, drifting, Time Attack, Road Racing – as well as the large-market race tires for Formula One, IndyCar, NASCAR, V8 Supercars, WRC, MotoGP and the like. Tires are specially engineered for specific race tracks according to surface conditions, cornering loads, and track temperature. Racing tires often are engineered to minimum weight targets, so tires for a 500-mile (800 km) race may run only 100 miles (160 km) before a tire change. Some tire makers invest heavily in race tire development as part of the company's marketing strategy and a means of advertising to attract customers. Racing tires used on tarmac stages are called slick. When the road is wet a driver will use intermediary slicks and when the road is dry the soft slicks are used. Racing tires often are not legal for normal highway use. This classification includes all forms of bicycle tires, including road racing tires, mountain bike tires, snow tires, and tubular tires, used also with other human-powered vehicles (see Category:Human-powered vehicles). Aircraft tires are designed to withstand extremely heavy loads for short durations. 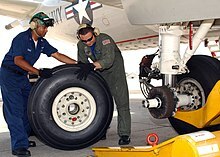 The number of tires required for aircraft increases with the weight of the aircraft (because the weight of the airplane has to be distributed better). Aircraft tire tread patterns are designed to facilitate stability in high crosswind conditions, to channel water away to prevent hydroplaning, and for braking effect. Aircraft tires are usually inflated with nitrogen to minimize expansion and contraction from extreme changes in ambient temperature and pressure experienced during flight. Dry nitrogen expands at the same rate as other dry atmospheric gases (normal air is about 80% nitrogen), but common compressed air sources may contain moisture, which increases the expansion rate with temperature. Aircraft tires generally operate at high pressures, up to 200 pounds per square inch (14 bar; 1,400 kPa) for airliners, and even higher for business jets. Tests of airliner aircraft tires have shown that they are able to sustain pressures of maximum 800 pounds per square inch (55 bar; 5,500 kPa) before bursting. During the tests the tires have to be filled with water, to prevent the test room being blown apart by the energy that would be released by a gas when the tire bursts. Aircraft tires also include fusible plugs (which are assembled on the inside of the wheels), designed to melt at a certain temperature. Tires often overheat if maximum braking is applied during an aborted takeoff or an emergency landing. The fuses provide a safer failure mode that prevents tire explosions by deflating in a controlled manner, thus minimizing damage to aircraft and objects in the surrounding environment. The requirement that an inert gas, such as nitrogen, be used instead of air for inflation of tires on certain transport category airplanes was prompted by at least three cases in which the oxygen in air-filled tires combined with volatile gases given off by a severely overheated tire and exploded upon reaching autoignition temperature. The use of an inert gas for tire inflation will eliminate the possibility of a tire explosion. There are many different types of motorcycle tires. The design of treads and the interaction of specific tire types with the roadway surface type produces considerable effect upon sound levels or noise pollution emanating from moving vehicles. These sound intensities increase with higher vehicle speeds. The acoustic intensity produced varies considerably depending on the tire tread design and the road surface type. The European Tyre and Rim Technical Organisation (ETRTO) is the European standards organisation "to establish engineering dimensions, load/pressure characteristics and operating guidelines" . for tires, rims and valves. It is analogous to T&RA. The Japanese Automobile Tire Manufacturers Association (JATMA) is the Japanese standards organization for tires, rims and valves. It is analogous to T&RA and ETRTO. The National Institute of Metrology Standardization and Industrial Quality (INMETRO) is the Brazilian federal body responsible for automotive wheel and tyre certification. CCC (China Compulsory Certification) is a mandatory certification system concerning product safety in China that went into effect in August 2002. Before CCC, there were two certification systems in China: CCIB and CCEE. With China's entrance into the WTO, these two systems were unified into the CCC certification system. After the termination of a one-year grace period in August 2003, the system became compulsory.The CCC certification system is operated by the State General Administration for Quality Supervision and Inspection and Quarantine of the People's Republic of China (AQSIQ) and the Certification and Accreditation Administration of the People's Republic of China (CNCA). Proper vehicle safety requires specific attention to inflation pressure, tread depth, and general condition of the tires. Over-inflated tires run the risk of explosive decompression (they may pop). On the other hand, under-inflated tires have a higher rolling resistance and suffer from overheating and rapid tread wear particularly on the edges of the tread. As tire tread decreases, there is more traction between the tire and the road resulting in better grip. However, there is an increased risk of hydroplaning, so as the tire wears the performance in the dry generally improves, but gets worse in the wet. Tires worn down past their safety margins and into the casing run the very real risk of rupturing. Also, certain combinations of cross ply and radial tires on different wheels of the same vehicle can lead to vehicle instability, and may also be illegal. Vehicle and tire manufacturers provide owners' manuals with instructions on how to check and maintain tires. A controversy began in 2000 regarding unusually high tire failures on some Ford vehicles. This resulted in the recall of the tires in question. A flat tire occurs when a tire deflates. This can occur as a result of normal wear-and-tear, a leak, or more serious damage. A tire that has lost sufficient pressure will impair the stability of the vehicle and may damage the tire further if it is driven in this condition. The tire should be changed and/or repaired before it becomes completely flat. Continuing to drive a vehicle with a flat tire will damage the tire beyond repair, possibly damage the rim and vehicle, and put the occupants and other vehicles in danger. A flat tire or low-pressure tire should be considered an emergency situation, requiring immediate attention. Some tires, known as "run-flat tires", have either extremely stiff sidewalls or a resilient filler to allow driving a limited distance while flat, usually at reduced speed, without permanent damage or hazard. A modern radial tire may not be visibly distorted even with dangerously low inflation pressure. (This is especially true of tires with a low aspect ratio, sometimes known as "low profile" tires.) Thus maintenance of adequate tire pressure can have important safety implications despite the fact that most car owners neglect it. Tire designers have tried to make new tires fail-safe so that the failure of the operator to maintain the tire pressure won't cause a major safety concern, but there are limitations on this. Tire bubbles, also referred to as bulges / bumps / protrusions / carbuncles, occur when the sidewall of the tire has failed, resulting in a protrusion. Causes of bubbles include having an impact at high speed, overinflation, or poor tire construction/manufacturing. It is generally recommended to replace the tire since the probability of tire failure has increased. They can occur on the inner or outer sidewall. This can sometimes be seen easily when looking at the symmetry of the tire lettering on the sidewall of the tire. Hydroplaning, also known as aquaplaning, is the condition where a layer of water builds up between the tire and road surface. Hydroplaning occurs when the tread pattern cannot channel away enough water at an adequate rate to ensure a semi-dry footprint area. Hydroplaning is more prevalent with wider tires and at higher speeds. When hydroplaning occurs, the tire effectively "floats" above the road surface on a cushion of water – and loses traction, braking and steering, creating a very unsafe driving condition. When hydroplaning occurs, there is considerably less responsiveness of the steering wheel. The correction of this unsafe condition is to gradually reduce speed, by merely lifting off the accelerator/gas pedal. Research and tests show that as tires age, they begin to dry out and become potentially dangerous, even if unused. Aged tires may appear to have similar properties to newly manufactured tires, but rubber degrades over time, and once the vehicle is traveling at high speeds (i.e. on a freeway) the tread could peel off, leading to severe loss of control. In tropical climates, tires degrade sooner than in temperate climates, and more care should be taken in these climates to ensure that tires do not fail. Also, tires on seldom-used trailers are at the greatest risk of age-failure, but some tires are built to withstand idleness, usually with nylon reinforcement. Many automakers recommend replacing tires after six years, and several tire manufacturers (Bridgestone, Michelin) have called for tires to be removed from service 10 years after the date of manufacture. However, an investigative report by Brian Ross on ABC's 20/20 news magazine found that many major retailers such as Goodyear, Wal-Mart, and Sears were selling tires that had been produced six or more years ago. Currently, no law for aged tires exists in the United States. Once tires are discarded, they are considered scrap tires. Scrap tires are often re-used for things from bumper car barriers to weights to hold down tarps. Some facilities are permitted to recycle scrap tires through chipping, and processing into new products, or selling the material to licensed power plants for fuel. Some tires may also be retreaded for re-use. One group did "a study to evaluate the possibility of using scrap tires as a crash cushion system. The objective of this study was to evaluate the material properties of used tires and recycled tire-derived materials for use in low-cost, reusable crash cushions". Americans generate about 285 million scrap tires per year. Many states have regulations as to the number of scrap tires that can be held on site, due to concerns with dumping, fire hazards, and mosquitoes. In the past, millions of tires have been discarded into open fields. This creates a breeding ground for mosquitoes, since the tires often hold water inside and remain warm enough for mosquito breeding. Mosquitoes create a nuisance and may increase the likelihood of spreading disease. It also creates a fire danger, since such a large tire pile is a lot of fuel. Some tire fires have burned for months, since water does not adequately penetrate or cool the burning tires. Tires have been known to liquefy, releasing hydrocarbons and other contaminants to the ground and even ground water, under extreme heat and temperatures from a fire. The black smoke from a tire fire causes air pollution and is a hazard to down wind properties. The use of scrap tire chips for landscaping has become controversial, due to the leaching of metals and other contaminants from the tire pieces. Zinc is concentrated (up to 2% by weight) to levels high enough to be highly toxic to aquatic life and plants. Of particular concern is evidence that some of the compounds that leach from tires into water, contain hormone disruptors and cause liver lesions. An asymmetric tire is a kind of specific stabilization method used in cars. An asymmetric tire may refer to a tire whose tread pattern does not form in line symmetry or point symmetry vis-à-vis its central line, thus having a distinct inside and outside edge. They may be mounted on either side of the vehicle. Since the tread pattern of many ordinary tires do not form symmetry in relation to design or pattern noise, the method of mounting tires is specially prescribed. This type of tires is used in many cases to promote tire performance, braking performance, and turning performance, since tread contact changes according to the change in alignment during travel. Tires may also be directional, where the tread pattern favors operation in one direction. This usually takes the form of v-shaped grooves that help to disperse water from the center to the edge of the tread. Symmetric directional tires can be used on both sides, but once mounted on a rim cannot be moved to the other side, since the tread pattern will be in the wrong direction. This restricts tire rotation. Some directional tires are also asymmetric, in which case there will be specific left and right-handed versions. An asymmetric tire may refer to a passenger car radial tire in which asymmetric structure stabilizing belts are built. Generally the stabilizing belts give a self-aligning torque when a motor vehicle is running straight ahead as well as when it is cornering. However, the sidewalls of the radial tire are so flexible that there will be a delay in the lateral reaction between the tread of the tire and the rim of its wheel as the vehicle is being steered positively. The lateral force will be transmitted from the front wheel to the rear of the vehicle, which will tend to be steered off course. Whereas the asymmetric belts bring a gradual change in the lateral displacement of the tire tread corresponding to the rim while the cornering load grows. The progressive change will harden the sidewalls to produce an immediate response to steering, which results in safer driving. Tires are not desired at landfills, due to their large volumes and 75% void space, which quickly consumes valuable space. Because of this, people have found other uses for old tires. Rubber tires are likely to contain some traces of heavy metals or other serious pollutants, but these are tightly bonded within the actual rubber compound they are unlikely to be hazardous unless the tire structure is seriously damaged by fire or strong chemicals. Used tires are employed as exercise equipment for athletic programs such as American football. One classic conditioning drill that hones players' speed and agility is the "Tire Run" where tires are laid out side by side, with each tire on the left a few inches ahead of the tire on the right in a zigzag pattern. Athletes then run through the tire pattern by stepping in the center of each tire. The drill forces athletes to lift their feet above the ground higher than normal to avoid tripping on the tires. Tires can be recycled into, among other things, the hot melt asphalt, typically as crumb rubber modifier—recycled asphalt pavement (CRM—RAP), and as an aggregate in portland cement concrete. Tires can also be recycled into other tires through retreading. Tires have also been cut up and used in garden beds as rubber mulch to hold in the water and to prevent weeds from growing. [dubious – discuss] There are some "green" buildings that are being made both private and public buildings that are made from old tires. The tire pyrolysis method for recycling used tires is a technique which heats whole or shredded tires in a reactor vessel containing an oxygen-free atmosphere and a heat source. In the reactor the rubber is softened after which the rubber polymers continuously break down into smaller molecules. ^ Harper, Douglas. "tire". Online Etymology Dictionary. ^ a b "tire, n.2." OED Online. Oxford University Press, December 2016. Web. 26 January 2017. ^ Peters, Pam (2004). The Cambridge Guide to English Usage. Cambridge University Press. p. 553. ISBN 978-0-521-62181-6. ^ Chisholm, Hugh, ed. (1911). Encyclopædia Britannica, vol. 26. Encyclopædia Britannica. p. 1007. ^ Fowler, H. W. (2009). David Crystal, ed. A Dictionary of Modern English Usage: The Classic First Edition. Oxford University Press. p. 655. ISBN 978-0-19-953534-7. Retrieved 2010-10-23. ^ Bertman, Stephen (2005). Handbook to Life in Ancient Mesopotamia. Oxford University Press. p. 35. Retrieved 2 August 2014. ^ "Technology & Innovation". www.dunlop.eu. ^ Dunlop, John Boyd (2008). Hutchinson Dictionary of Scientific Biography. AccessScience. Retrieved 9 July 2009. ^ a b c Michelin. "Radial or bias, the right choice / Properly use your tires - Michelin Agricultural Tires". www.michelinag.com. Retrieved 2017-08-04. ^ a b c d e f g "History". www.jags.org. ^ a b c "A Tale of Two Tires". Bloomberg. ^ Samuel K. Clark, V. E. Gough (1981). Mechanics of Pneumatic Tires. U.S. Department of Transportation. p. 245. Consider two mechanisms of force transmission acting in parallel. ^ a b Samuel K. Clark, V. E. Gough (1981). Mechanics of Pneumatic Tires. U.S. Department of Transportation. p. 246. The only possible way in which the reaction can develop at the rim is by the changes in magnitude and direction of the membrane stresses at their points of attachment to the rim, in the region of the membrane near the point where the plate is pressed against it. ^ Samuel K. Clark, V. E. Gough (1981). Mechanics of Pneumatic Tires. U.S. Department of Transportation. p. 246. This force pulls the bead coil against the base of the wheel rim above the contact area, thus transmitting the upward force to the wheel. ^ "Powersports - ATV and UTV tire applications for off-road fit". cocomponents.com. ^ "Pros and Cons of Radial vs. Bias-Ply Tires in Construction". ^ "Advantages and Disadvantages of Radial Tires". ^ "An unknow object: the tire - Materials". Michelin The tire digest. Retrieved 2017-07-21. ^ "What's the Difference Between Natural and Synthetic Rubber for Tires?". Kal Tire. 2017-07-21. Retrieved 2017-07-21. ^ a b "World Tires". Freedonia. Freedonia Group. Retrieved 19 May 2017. ^ Davis, Bruce. "2015 was strong year for U.S. tire industry". Tire Business. Crain Communications. Retrieved 13 December 2016. ^ "Shift of emphasis". Rubber World. 1 April 2012. ^ Cook, David (2015). Robot Building for Beginners (3 ed.). Apress. p. 458. ISBN 9781484213599. ^ "Alternative Fuels Data Center: Low Rolling Resistance Tires". www.afdc.energy.gov. Retrieved 2015-10-31. ^ a b "Dynamic Mechanical Properties Of Passenger And Light Truck Tire Treads". Report No. DOT HS 811 270. National Highway Traffic Safety Administration, U.S. Department of Transportation. 2010. ^ Hao, P. T., Ismail, H., & Hashim, A. S. (2001). Study of two types of styrene butadiene rubber in tire tread compounds. Polymer Testing, 20(5), 539-544. ^ Nordsiek, K. H.; Kiepert, K. M. The Characteristic features of vinylbutadienes. International Rubber Conference, Harrogate, England, June 8–12, 1982. ^ a b "SOLUTION STYRENE‐BUTADIENE RUBBER (S‐SBR)" (PDF). International Institute of Synthetic Rubber Producers, Inc. August 2012. Archived from the original (PDF) on May 12, 2013. Retrieved October 31, 2015. ^ Xu, S. H., et al. "Effects of partial replacement of silica with surface modified nanocrystalline cellulose on properties of natural rubber nanocomposites." Express Polym Lett 6.1 (2012): 14-25. ^ Peddini, S. K., et al. "Nanocomposites from styrene–butadiene rubber (SBR) and multiwall carbon nanotubes (MWCNT) part 2: Mechanical properties." Polymer 56 (2015): 443-451. ^ Yang, Ganwei, et al. "Effects of substitution for carbon black with graphene oxide or graphene on the morphology and performance of natural rubber/carbon black composites." Journal of Applied Polymer Science 132.15 (2015). ^ "Tread compound production method - WO 2014068486 A1". IFI CLAIMS Patent Services. Retrieved 20 February 2016. ^ "Study on Uniformity Force Variations in PCR & UVR 16" & 17" Tyre Sizes". 2014-06-05. Archived from the original on 2016-01-02. ^ "Rain Groove". RightTurn. Dealer Tires. Retrieved January 27, 2017. ^ KwikFit. "How can I tell when my tyres need changing?". Retrieved 2010-10-23. ^ Jazar, Reza N. (2008). Vehicle dynamics: theory and applications. Springer. p. 11. ISBN 978-0-387-74243-4. Retrieved 2011-03-16. Inner layers are made of different fabrics, called plies. ^ Jewel, Elizabeth, ed. (2006). The Pocket Oxford Dictionary and Thesaurus. Oxford University Press. p. 722. ISBN 978-0-19-530715-3. Retrieved 2012-03-14. ^ "Demounting and Mounting Procedures" (PDF). Occupational Safety and Health Administration. 2011. Retrieved 2012-03-14. ^ American Machinist, Volume 40. 1914-04-02. pp. 597–598. Retrieved 2012-03-14. ^ a b "Plies and angles - see how they run". Popular Mechanics. 136 (3): 62. March 1972. Retrieved 13 March 2014. ^ "Bias vs Radial Tires". Mud-throwers.com. Retrieved 2010-10-23. ^ Jones, Thomas H. (1980). "Get things moving with casters, glides, and wheels". Popular Science. 216 (5): 148. ISSN 0161-7370. ^ "Thomas Net sources for industrial use 'Semi-Pneumatic Wheels'". Thomasnet.com. Retrieved 2010-10-23. ^ "Car Talk Service Advice: Tire Pressure". Archived from the original on 2011-12-03. Retrieved 2009-01-16. ^ Lydall, Ross (2010-05-21). "Taking a ride on Boris's hot wheels hire bikes". London Evening Standard. Retrieved 2010-06-29. ^ "Do Nitrogen-Filled Tires Enhance Fuel-Efficiency?". Scientific American. September 30, 2008. Retrieved 2010-06-29. ^ Tom and Ray Magliozzi (February 2005). "Dear Tom and Ray". CarTalk.com. Retrieved 2010-06-29. ^ Petersen, Gene (October 4, 2007). "Tires - Nitrogen air loss study". Consumer Reports. Retrieved 2011-12-10. Bottom line: Overall, consumers can use nitrogen and might enjoy the slight improvement in air retention provided, but it's not a substitute for regular inflation checks. ^ "Air or Tire". Retrieved 2015-04-15. ^ "FEA Chapter III: Tire pressure survey and test results". Retrieved 2009-01-16. ^ "NHTSA test". Retrieved 2009-01-16. ^ a b Gilles, Tim (2005). Automotive Chassis: Brakes, Suspension, and Steering. Santa Barbara: Thompson Delmar Learning. p. 551. ISBN 9781401856304. ^ "What are Retread Tires?". Best Tires Guide. Archived from the original on 2014-07-17. Retrieved 2014-04-06. ^ "Retread Tires". U.S. Environmental Protection Agency. 2008-09-24. Retrieved 2010-10-23. ^ Brodsky, Harvey. "Federal Government Endorses the Use of Retreaded Tires". Tire Retread Information Bureau. Archived from the original on May 25, 2009. Retrieved 2010-10-23. ^ Agency, INK. "Tire Match Mounting and Balancing - Yokohama Tire". www.yokohamatire.com. ^ Nicholas D. Smith (2003). "Understanding Parameters Influencing Tire Modeling" (PDF). Department of Mechanical Engineering, Colorado State University. Archived from the original (PDF) on 2008-09-20. Retrieved 2014-11-23. ^ SAE. "TKPH application". Retrieved October 7, 2007. ^ Bridgestone. "How to use TKPH". Archived from the original on September 27, 2006. Retrieved October 7, 2007. ^ Goodyear. "New temperature prediction model improves on current TKPH formula". Archived from the original on November 6, 2006. Retrieved October 7, 2007. ^ Brown, Sheldon. "Sheldon Brown on tires". Retrieved 2008-07-01. ^ a b "49 CFR 574.5 - Tire identification requirements.". ^ "Dept. of Transportation issues new DOT codes". ^ "Goodyear Tire Recall - Goodyear Tires". www.goodyear.com. ^ Subcommittee: F09.20 (2016). "ASTM F1805 – 16: Standard Test Method for Single Wheel Driving Traction in a Straight Line on Snow- and Ice-Covered Surfaces". ASTM Book of Standards. West Conshohocken, PA: ASTM International. 9.02: 14. doi:10.1520/F1805-16. Retrieved 2017-03-26. ^ Norbye, Jan (November 1972). "The truth about studded tires". Popular Science. 201 (5): 76–77. Retrieved 29 January 2013. ^ Markus, Frank (July 2004). "Racing Fast 'n' Cheap: Ice Racing". Motor Trend. Retrieved 29 January 2013. ^ "Mud Terrain Tires vs All-Terrain Tires: Comparison". AutoCarSpec. April 2017. ^ Force, United States Dept of the Air (1974). Aerospace safety. for sale by the Supt. of Docs., U.S. Govt. Print. Off. ^ "FAA Airworthiness Directive". Retrieved 2013-06-15. ^ "Why Nitrogen". Retrieved 2013-06-15. ^ Hogan, C. Michael (September 1973). "Analysis of highway noise". Journal of Water, Air, & Soil Pollution. Springer Verlag. 2 (3): 387–392. doi:10.1007/BF00159677. ISSN 0049-6979. ^ ETRTO Standards Manual 2007. Bruxelles, Belgium: ETRTO. 2007. pp. I. ^ "ABC News: Aged Tires Sold as 'New' by Big Retailers". Abcnews.go.com. Retrieved 2010-10-23. ^ 05/09/2008 (2008-05-09). "Aged Tires: A Driving Hazard?". Abcnews.go.com. Retrieved 2010-10-23. ^ Hossain, Mustaque; Nabors, Daniel (Jan–Feb 2005). "Testing and evaluation of used automobile tires and recycled tire-derived materials for low-cost crash cushions". 36 (9). Journal of Materials in Civil Engineering. Archived from the original on 2011-07-25. Retrieved 2010-10-23. ^ "Tire-Derived Fuel". U.S. Environmental Protection Agency. Retrieved 2011-12-29. ^ Sullivan, Joseph P. (2006). "An Assessment of Environmental Toxicity and Potential Contamination from Artificial Turf using Shredded or Crumb Rubber" (PDF). Retrieved 2009-06-01. ^ Chalker-Scott, Linda. "The Myth of Rubberized Landscapes" (PDF). Archived from the original (PDF) on 2009-10-07. Retrieved 2009-06-01. ^ "A new use for old tires: A garden using tires - Backwoods Home Magazine". www.backwoodshome.com. ^ News, A. B. C. (30 December 2010). "'Earthships' in the Desert Save Owners Cash". ABC News. ^ "404 Not Found - The Survivalist Blog". www.thesurvivalistblog.net. ^ ROTSTEIN, ARTHUR H. (28 July 1996). "Tire Dam to Tread on Erosion Problem" – via LA Times. ^ Sawyers, Harry. "One Day Project: Kid's Backyard Tire Swing". Popular Mechanics. Retrieved April 1, 2013. ^ McCormick, Sean. "No Frills Football Conditioning". About.com. Archived from the original on 2013-04-03. ^ Ireland, Jae (November 24, 2010). "Football Tire Drills". LiveStrong. Retrieved April 1, 2013. ^ Kandhal PS. (1992). WASTE MATERIALS IN HOT MIX ASPHALT - AN OVERVIEW. National Center for Asphalt Technology. ^ M Nehdi, A Khan, (2001). Cementitious Composites Containing Recycled Tire Rubber: An Overview of Engineering Properties and Potential Applications. Cement, Concrete, and Aggregates. ^ Beukering, P. J. van (2001-02-28). Recycling, International Trade and the Environment. Springer Science & Business Media. ISBN 9780792368984. ^ Bignozzi, Maria Chiara (2011). "Sustainable Cements for Green Buildings Construction". Procedia Engineering. 21: 915–921 – via ScienceDirect. French, M.J. (1991). The U.S. tire industry: A history. Boston: Twayne Publishers. Look up inner tube in Wiktionary, the free dictionary. Look up tire or tyre in Wiktionary, the free dictionary. Wikimedia Commons has media related to Tires. U.S. Government tire rating and maintenance site.